The AOS congratulates the following students for excellent papers and presentations at the very successful, AOS cosponsored, ANZCOP conference last week in Queenstown, NZ. These papers resulted in the award of the following prizes. 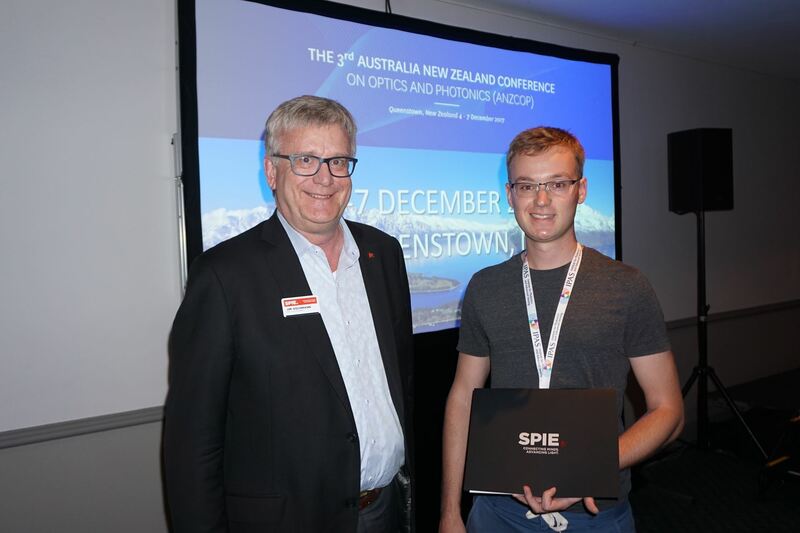 James Spollard, Australian National University PhD student, won the SPIE prize. This prize is a consequence of our MoU with SPIE and includes $1500 towards attending an SPIE conference. The photo shows Jim Oschmann, Vice-President of SPIE awarding the prize. 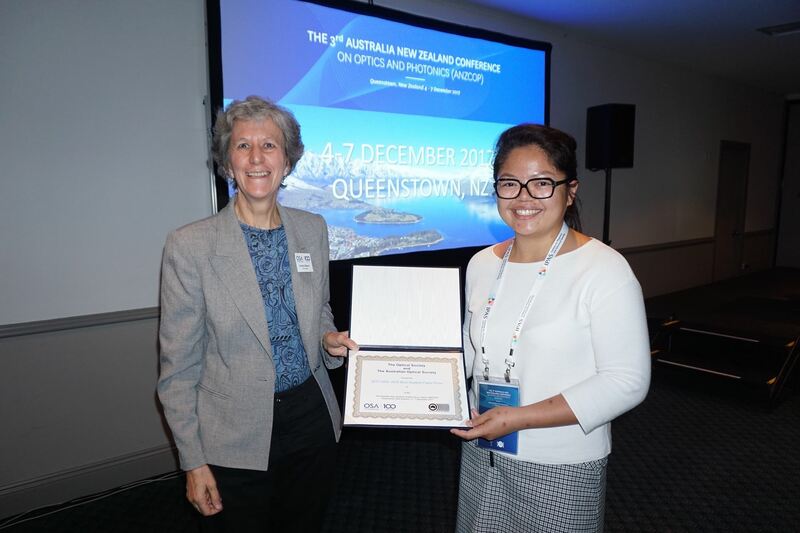 Sara Lau, University of Queensland PhD student, won the OSA prize for best oral presentation. This cash prize is a consequence of our MoU with the OSA. The photo shows Ursula Gibson, Vice-President of OSA awarding the prize. 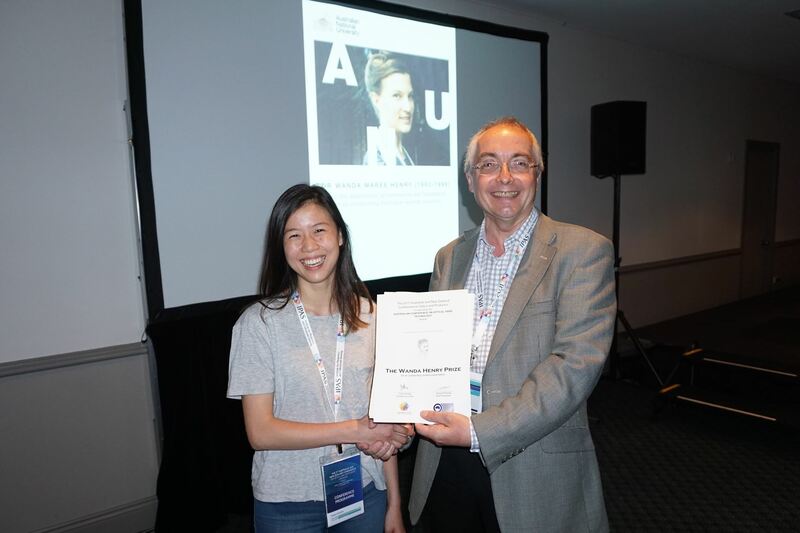 Calida Tang, University of Sydney senior undergraduate student, won the Wanda Henry prize. This cash prize is awarded each year at ACOFT (one of the constituent events of ANZCOP). The photo shows Simon Fleming, President of AOS awarding the prize. The Dodd-Walls Centre, ANZCOP cosponsor, also provided several student poster prizes. AOS and SPIE have renewed our Memorandum of Understanding (MoU) for another three years. 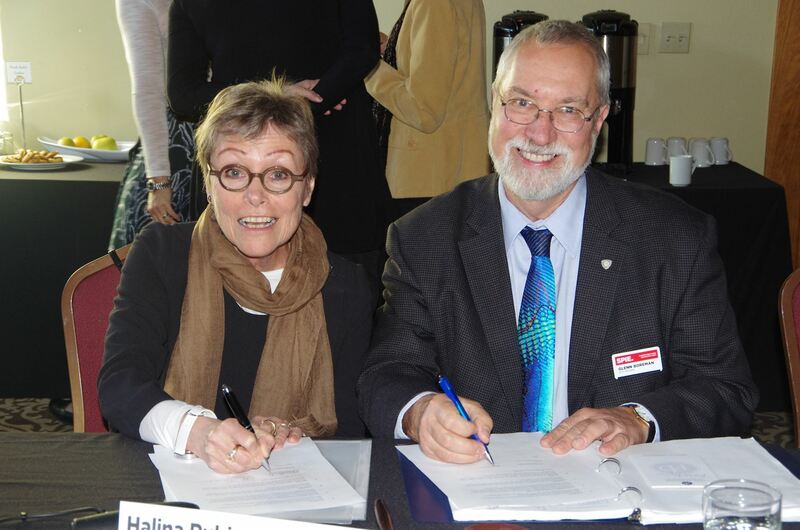 The agreement was signed on 28th October by Halina Rubinsztein-Dunlop and Glenn Boreman. The purpose is to promote optics and photonics research and education and serve members of the international optical science and engineering community. The terms of the MoU include information exchange, joint promotion of events and activities, leadership exchange visits, and an SPIE student prize at our annual conference. The AOS is delighted to announce the winners of several of the AOS Prizes for this year. The AOS Geoff Opat Early Career Researcher Prize has been awarded to Dr Sergey Kruk from ANU. Well done Sergey and Litty! Look out for articles in forthcoming issues of AOS News from the winners. Note that Sergey will give an Invited Talk at ANZCOP in Queenstown in December on his prize-winning work. The 2016 winner, Andrea Blanco Redondo, will also give her Geoff Opat talk at ANZCOP. The AOS Prize Committee is still deliberating regarding the Beattie Steele Prize and a further announcement should be forthcoming. Congratulations to A/Prof Igor Aharonovich (UTS) and Dr Mohsen Rahmani (ANU) for winning The Young Scientist Award of the Year 2017 for the Commission on Laser Physics and Photonics (C17), International Union of Pure and Applied Physics (IUPAP)! Igor was awarded for the Applied Aspects and Mohsen for the Fundamental Aspects, respectively. Find more from the Official Announcement. At the Annual General Meeting of the AOS on 5th December 2016 two Councillors retired, and two new Councillors were elected. We say goodbye to Anne Roberts, who was the last Past President, and Maryanne Large, and thank them for the very valuable contributions to the AOS. We welcome Daniel Gomez, from RMIT, and Frederique Vanholsbeeck, from Auckland. Stephen Collins moves to Past President, Simon Fleming to President, and John Harvey was elected to Vice President. For more detail see Council. It is with great sadness that we notify you of John Love’s passing today at 6:45am on 19 June 2016. He was surrounded by loving friends in Canberra hospital on his last day. Born in England 2nd October 1942, John Love was a Life Member of the Australian Optical Society and winner of the prestigious Beattie Steel medal. 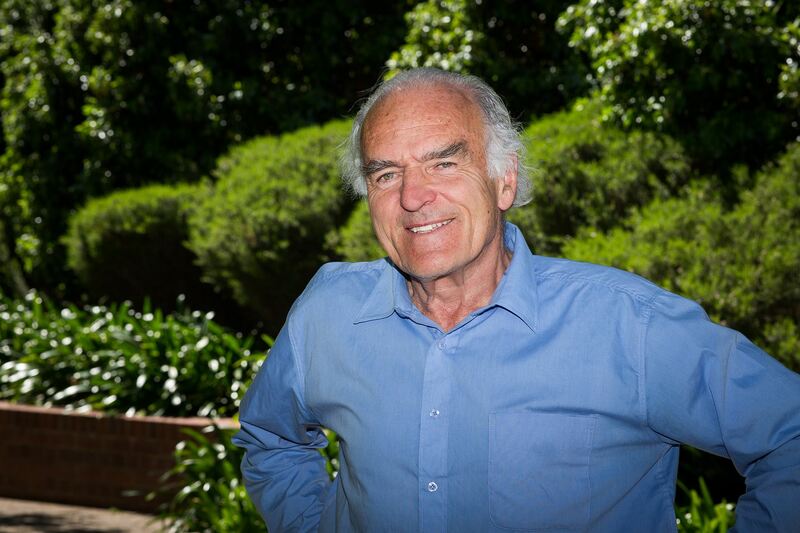 His career in optics and photonics began when he arrived in Australia in 1973. Over the following forty plus years he made a major impact on the field. He is widely known for the definitive textbook, Optical Waveguide Theory, with 5500 citations and translated into Russian and Chinese. John was an enthusiastic champion of many important research and educational initiatives in Australia, including being a stalwart of the ACOFT conference, the world’s second longest running photonics conference. He also leaves a much more direct and personal impact on the very many students and young academics he mentored, who will remember him with love and respect, especially for how generous he was with his time and knowledge. Funeral arrangements are yet to be finalised, although anticipated to be in approx. a week’s time. For notification of details please contact either Susan (susan.dart@bigpond.com) or Lin (lin.thorncraft@bigpond.com). The AOS is delighted that two of our Councillors, Professors Halina Rubinsztein-Dunlop and Benjamin Eggleton, have been made Fellows of the AAS.